No one goes to Parkton, NC. It’s not a destination. It’s not even a town you pass through onto some better place, because it’s about 10 minutes from the closest highway. If you find yourself in Parkton, which is 20 minutes from Fayetteville and 20 minutes from Lumberton, it’s because you live there. Because of this, the Parkton Grill has a very local feel. When I walked in, the place was pretty packed, which made me wonder if everyone in Parkton was at the Grill at that moment. In truth, there are a little over 400 people in Parkton; that’s from a low of 219 people in 1910, and a high of 906 people in 1960. The population has dropped pretty consistently every year since 1960, and looking around the town this day, you have to wonder what keeps the locals from leaving. There’s nothing in Parkton, NC. Picture a lot of empty lots. The skeletons of small, old factories. Store fronts of empty buildings that used to offer things like vacuum and television repair services. There’s a train track, a few gas stations, and weeds growing out from every break in the concrete. A couple years ago, when Hurricane Matthews came through, Parkton was one of those towns left underwater. After everything dried up, most of the county recovered back to their pre-hurricane days, but that’s not saying much in Robeson County, and it’s not saying anything to a town like Parkton. The schools in Parkton, just like their neighboring towns, could pass for schools well after the apocalypse. Nothing looks lived in. The county of Robeson is extremely insulated. To give you an idea of just how insulated, in a county of approximately 135,000, there’s probably 6 last names. Throw a stone, and you will hit someone named Locklear. So for those growing up in this area, they rarely leave. If they do leave, they don’t come back. And if they don’t leave while they’re young, they never leave. This is the environment the Parkton Grill sits in. And the Parkton Grill fits well. Like Parkton, if you didn’t know the grill is there, you’ll pass by it without a thought. When you enter, the kitchen takes up half the area. It’s as if they merely placed tables and chairs in the only space available in the kitchen. But it’s a greasy spoon, in a warn-down town, so you don’t go in for the ambiance. You go in for the food. I found a seat near the back and sat into a chair that was too low for the taller table. I felt like a toddler, with my arms high, like my dad had pulled me up to an ice cream parlor bar for my first milk shake. 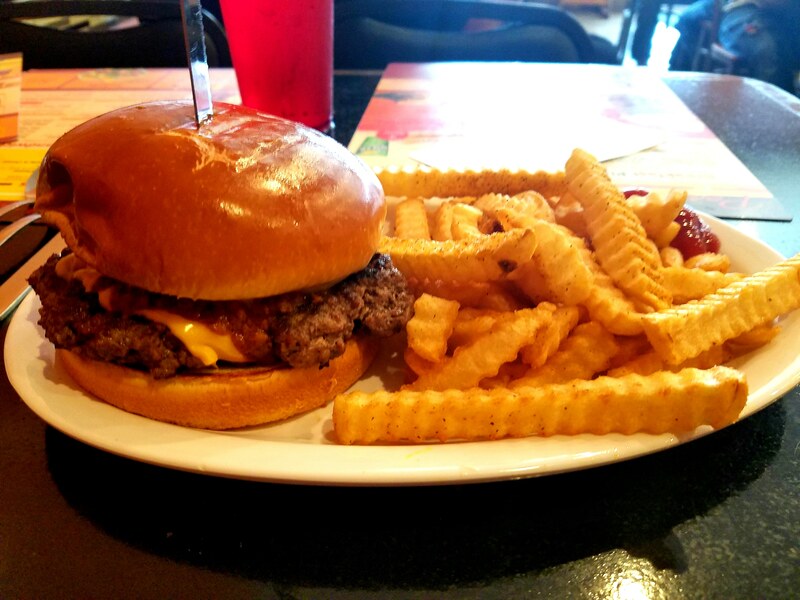 Looking over the menu, I decided on their hamburger – the Mega Burger. After looking at the description, I saw that their burgers always include mustard, ketchup, onions, chili, and cole slaw. I ordered the Mega Burger, no cheese and no cole slaw, with a side of fries. The time it takes to prepare a meal is always fine with me, as long as it’s worth it. But 40 minutes for a burger and fries? Could it be that the only functioning business in all of Parkton is not functional? There was a large takeout order that derailed the kitchen, so even with the place almost full, a takeout order for people that weren’t even there was causing everyone to wait for their food. 40 minutes, for a burger and fries. When the food finally arrives, I decided that the wait won’t matter as long as the food is good. Even the waitress made the joke, “Took us long enough.” But when she placed the plate down, all I saw was the cheese. Here’s my thing about cheese. It’s okay, but it’s not my favorite. Yes, we exist. People that are not fans of cheese exist in this world, and we have rights! Typically when people learn that I don’t like cheese, they ask me about pizza. I do like pizza. As a result, I had to develop a rule over time that better explained where I stood with cheese. In other words, I had to rationalize my preference for no cheese, because cheese fans are irrational. I don’t like cheese when it is the dominant flavor, or texture. With a pizza, the dominant flavor is the sauce, and the dominant texture is the crust. With a burger, however, a slice of cheese overwhelms the taste, and the cheese becomes the dominant flavor. That’s true with most things I’ve eaten. If cheese is involved, the cheese is the dominant flavor or texture. After 40 minutes, I was so hungry that I couldn’t return the plate. I ate the Mega Burger without a pause, and what I found was that the Mega Burger could be called the Nacho Burger. The chili was the dominant flavor, and the meat and bun the dominant texture. The cheese might as well not have been there. After my first fearful bite, I ate the rest of the Mega Burger without hesitation. Almost any amount of time to make a dish is worth it if the food is good. But 40 minutes for a burger? After a couple of bites, I would have waited a full hour. The Parkton Grill gets a lot wrong, with the town, the drab exterior, the noise of the kitchen, the chairs too low for the table, the crowded eating area, the wait, and the errors in the order, but the one thing that the Parkton Grill needs to get right, it got absolutely right.